Houston is thousands of miles from Abu Dhabi, the United Arab Emirates (UAE). 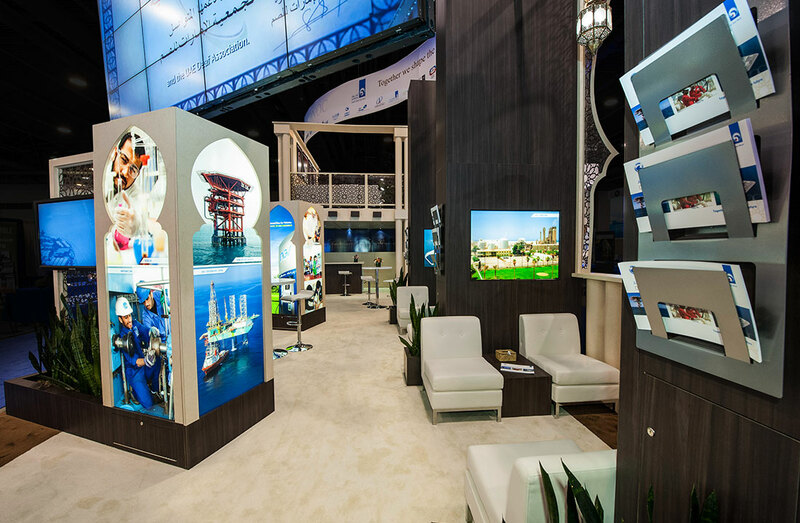 But for those who stepped into the Abu Dhabi National Oil Company (ADNOC), exhibit environment at the 2013 Offshore Technology Conference (OTC2013), they might have thought they were right in the heart of ADNOC’s corporate headquarters. 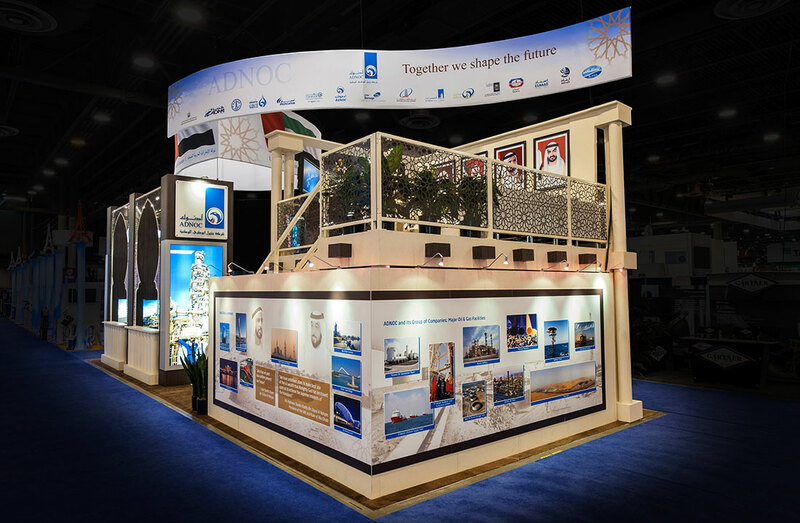 Which is exactly the mood, feel and flavor that 2020 Exhibits wanted ADNOC’s OTC2013 experience to convey. As a major diversified group of energy and petrochemical companies that manages and oversees oil production of more than 2.7 million barrels a day, ADNOC ranks among the top ten oil and gas companies in the world. 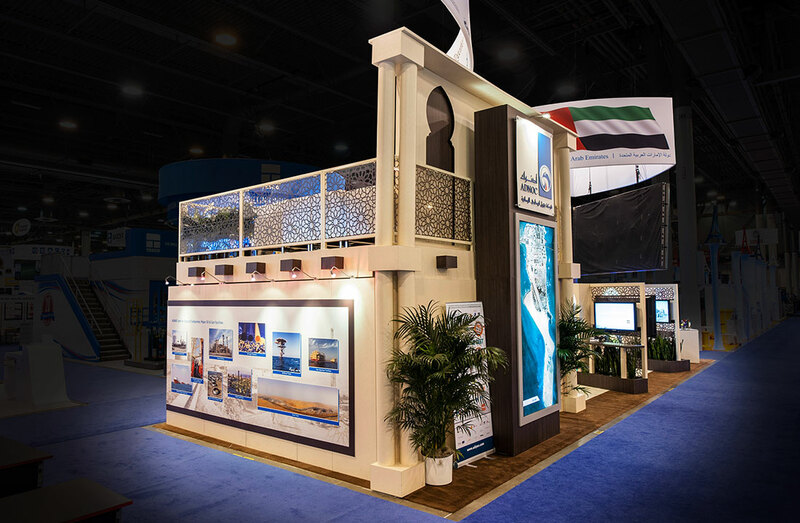 ADNOC challenged 2020 Exhibits to deliver an exhibit and an experience that would be reflective of the region’s pride in its rich history as well as its total embrace of innovation and modern development. Celebrating the culture, people and spirit of the UAE, this is exactly the tone and approach ADNOC wanted to convey on this world stage. In a word, just like home. 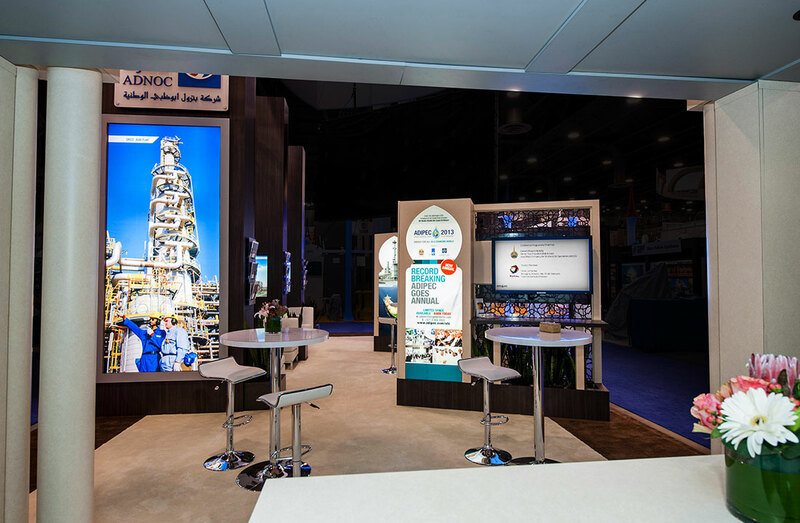 2020 Exhibits helped to deliver meaningful experiences and touch points throughout this 20-by-50 foot exhibit. The tone was set from the very first moment visitors stepped inside the ADNOC experience, with many familiar smells and flavors of the region, including rich Arabic coffees and sweet figs and dates. Hospitality was paramount, with the experience expertly weaving together the storied and honored ADNOC history with their modern, technology and resource-rich nation. Maximizing the impact of a broad range of creative and interactive technologies, the large, hanging 90” video wall drew attention from across the show floor. High above the exhibit, a 15’ convex triangular hanging fabric sign highlighted the UAE’s flag, with a corresponding 30’ serpentine fabric sign showcasing ADNOC’s group of 16 companies. 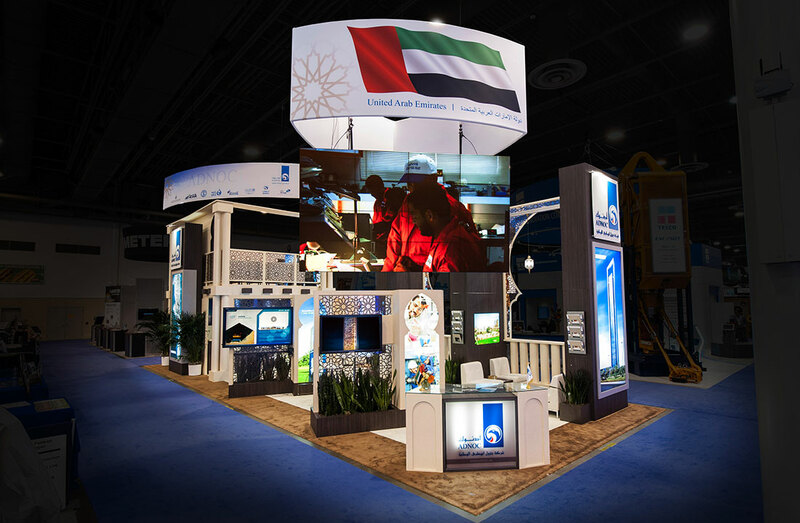 Four 46” touch screen kiosks showcased ADNOC and the UAE’s history and role in the energy industry. Maximizing all available angles and lines of sight to captivate these all-important attendees, the layout included comfortable, accommodating areas for reception, hospitality, conversation and informal meetings all while maintaining openness for booth traffic to flow through the exhibit. A private, VIP lounge and meeting covered the second level. Functional storage and amenities were smartly tucked throughout the space, including a private service kitchen housed beneath the upper deck. The design team practiced restraint using crisp branding with deep, dark wood and custom elements influenced by the region’s architecture and heritage, including large archways. Custom-patterned motifs emblazoned on frosted laminate and across branded signage helped to delineate the space and provide an intimate custom feel. 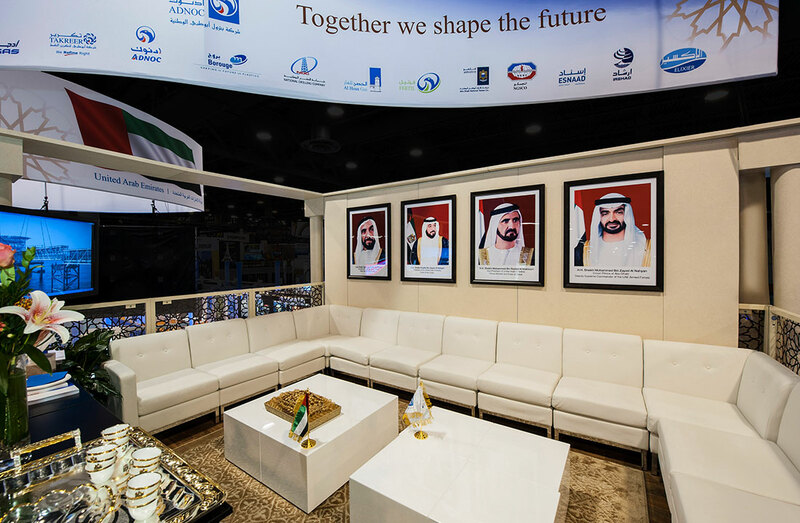 Comfortable, sophisticated and modern, the exhibit set the world stage for ADNOC, resulting in deeper, more personal conversations, with renewed and new found relationships throughout the show. Like the one-of a kind heritage it represents, the exhibit was fresh, inviting and modern: Welcome home.